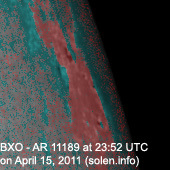 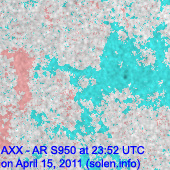 Last major update issued on April 16, 2011 at 03:35 UTC. 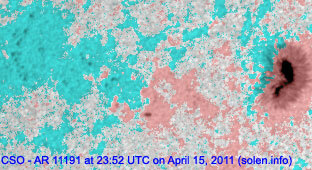 The geomagnetic field was quiet on April 15. 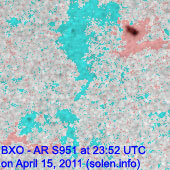 Solar wind speed ranged between 346 and 406 km/s. 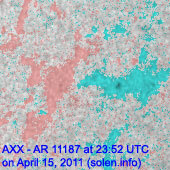 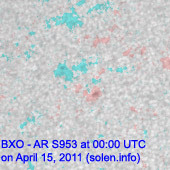 Solar flux measured at 20h UTC on 2.8 GHz was 129.4 (increasing 40.6 over the last solar rotation). 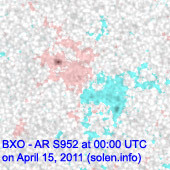 The planetary A index was 6 (STAR Ap - based on the mean of three hour interval ap indices: 6.0). 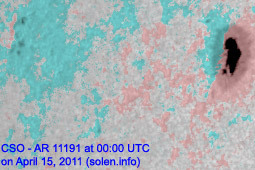 Three hour interval K indices: 22012221 (planetary), 22112212 (Boulder). 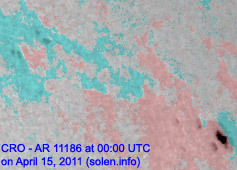 Region 11187 reemerged in the southwest quadrant. 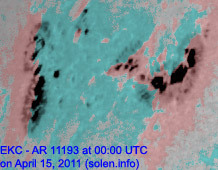 Region 11190 developed further as most of the spots in the leading and intermediate spot section merged into a single large penumbra. 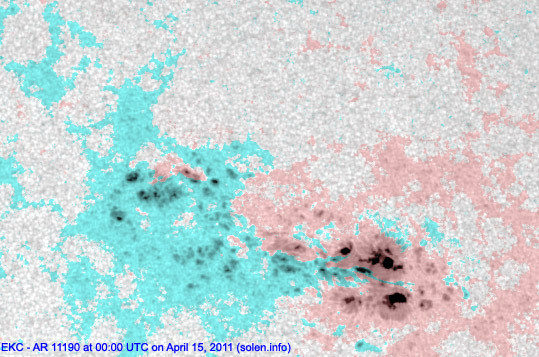 This penumbra is complex as positive polarity spots have invaded the eastern central part creating a strong magnetic delta structure. 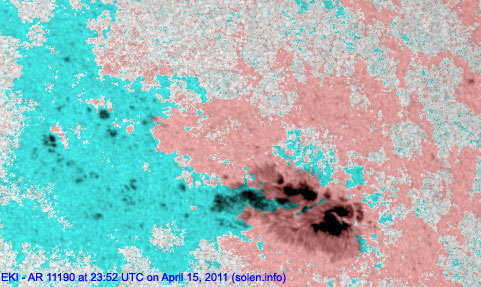 Further M class flares are likely and there's a chance of a major flare. 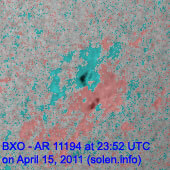 Flares: C1.8 at 03:55, C1.3 at 04:41, C1.6 at 09:36, C2.8 at 13:50, C2.0 at 14:49, C1.6 at 16:14 and M1.3/1F at 17:12 UTC. 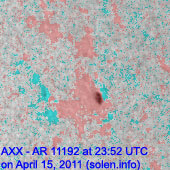 Region 11191 added several tiny spots in the trailing spot section. 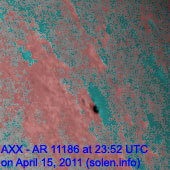 Region 11193 decayed slowly and became less complex. 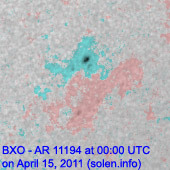 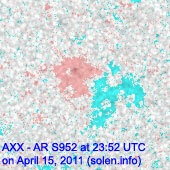 There's still polarity intermixing and the region could produce an M class flare. 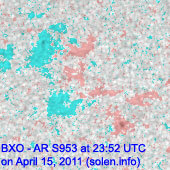 [S953] emerged in the northeast quadrant on April 14. 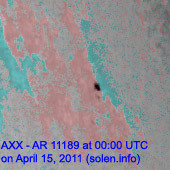 Location at midnight: N21E13. 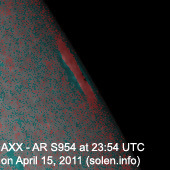 April 13-14: No obviously Earth directed CMEs were observed in LASCO and STEREO imagery. 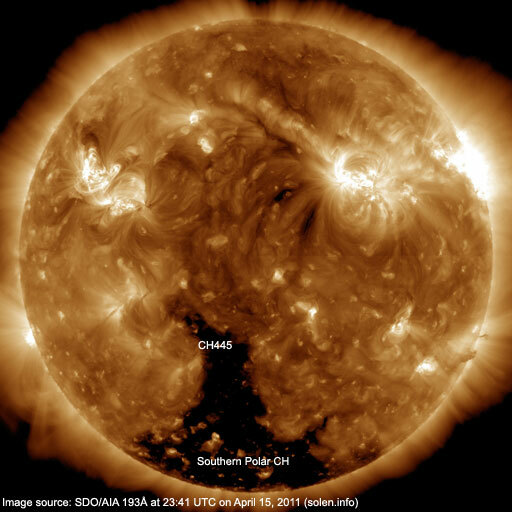 An extension (CH445) of the southern polar coronal hole will be Earth facing on April 16. 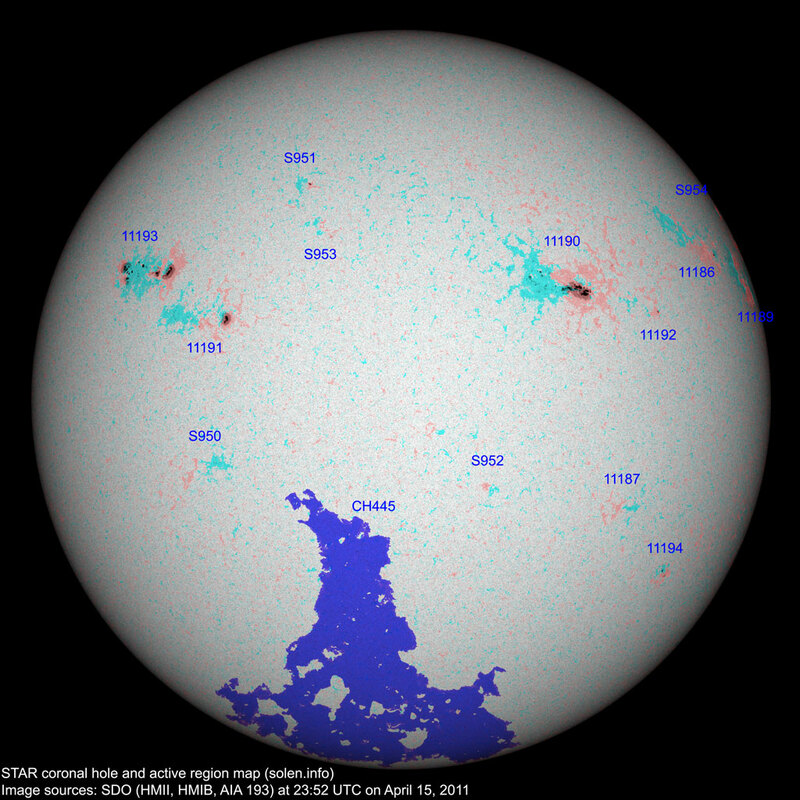 The geomagnetic field is expected to be mostly quiet on April 16-18. 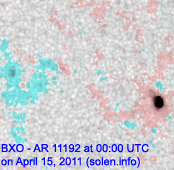 On April 18 and 19 there's a chance of weak effects from a CME observed early on April 15. 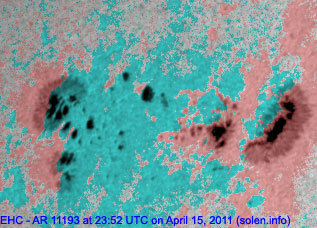 On April 19-20 a high speed coronal hole stream could reach Earth and cause some unsettled and active intervals.